Counting time has been a human preoccupation for centuries. We’ve just entered 2019 here in the West, but in the Chinese lunar calendar, it’s already 4717. February 5 marks the beginning of the Year of the Earth Pig. Welcome to the future! The Vietnamese New Year (Têt) also starts on the same day. Do you know why they say “Guo Nian” to wish happy New Year, and why it’s lucky to wear the color red and throw firecrackers? Legend has it that a hungry demon named Nián used to swim up from the depths of the ocean, ravenous in the depths of winter, and terrorize the poor villagers nearby. Nián would eat everything – animals, crops, humans, and especially children. So the villagers would flee to the mountains to escape his terrible maw. But one year a beggar appeared just as the villagers were preparing their exodus. An old woman offered him food, and in return, he promised to stay in the village overnight and protect it from Nián’s depredations. The villagers thought he was crazy, but in their rush to save themselves they left him behind. To their great surprise, when they returned the next day, not only were their houses and farms intact, but the beggar was happily waiting for them with a peaceful demeanor. “But how…?” they asked. The beggar laughed. He told them that Nián, being a demon of the deep ocean, was afraid of the color red and of the noise and light of firecrackers. That was all it took to scare him away. The villagers thanked the beggar profusely, and perhaps some of them weren’t surprised when he revealed himself to be a god and flew away. Since then, the New Year is celebrated with these lucky talismans, and “Guo Nian” or “overcome Nian” is the watchword of the day. Are you up for new beginnings this year, or are you ready to move on from something you’ve overcome? 2018 was the Year of the Dog, which was a buckle-down, nose-to-the-grindstone period. It wasn’t notable for being fun or easy-going in work or relationships, but hopefully, some important milestones were accomplished. Fortunately, 2019 is supposed to be less tumultuous. In fact, abundance and a feeling of lightness can characterize this period. This is the final year of the 12-year cycle of earthly branches (which are symbolized by the animals of the Chinese zodiac), and this state change is what drives the positivity (insert sigh of relief here). Make time to relax and enjoy your loved ones, and if you want to a peek at what’s in store, check out your Chinese horoscope here. Naturellement, with the Chinese population in France last estimated to be between 600,000 to 700,000, it’s no wonder that there is a thriving Chinese community in the capital city. And when the Lunar New Year – the biggest holiday of the year for Chinese everywhere – rolls around, Parisians join in the celebrations big time! Each year, the three main Asian communities in Paris – Le Marais, Belleville and the city’s main “Chinatown” in the 13th arrondissement – go all out to celebrate, over nearly three weeks packed with cultural activities and colorful parades. This year, the Musée Guimet, the prestigious Asian museum in the 8th arrondissement, joins in the festivities! This lively quartier is hosting a week of free cultural activities from Feb 4-9, including photo exhibitions, music and poetry, well-being and Chinese medicine conferences, craft classes for kids (and origami for adults), and qi gong and dance classes. See the dates and times HERE. It wraps up in style with a colorful parade at République on February 10 at 2 pm, launched by a lion and dragon dance in the Place. If you have children, take them to get free face painting beforehand from 10 am-12 pm at l’Association Pierre Ducerf, 29 rue Michel Le Comte. Click HERE for details. Another of the city’s main Asian communities is in Belleville, which is home to many Chinese immigrants from Wenzhou, and the surrounding Zhejiang province. 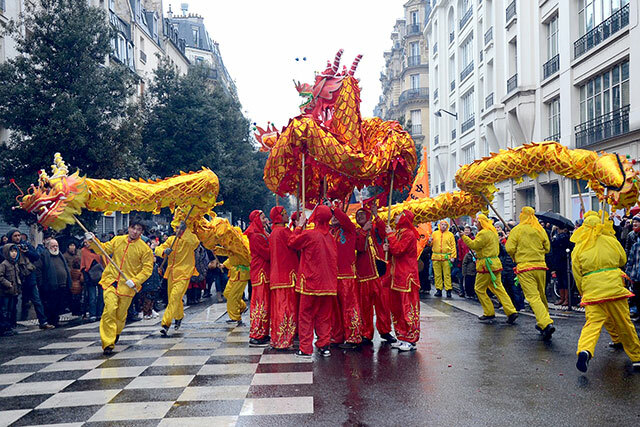 On Sunday, February 17th, head to Metro Belleville in the 20th arrondissement at 1:30 pm to catch the awakening of the dragon and its accompanying festive parade. Stick around for the dance performances and martial arts demonstrations near the Belleville metro from 3 pm onwards. Check HERE for more details. We all know the 13th as the Chinese arrondissement par excellence, and they’re certainly not to be outdone this year. Two weeks of festivities and cultural events take center stage from Feb 4-17. See the full schedule of art, opera, conferences and concerts HERE. It culminates in a massive parade on Feb. 17 around 1 pm at 44 avenue d’Ivry that attracts 100,000 spectators. Go big or go home, right? See the map HERE. The Guimet Museum celebrates the CNY from Feb 8-10 with several activities integrated into their fabulous Asian art collections of over 20,000 pieces dating back to 7000 years. The program begins Friday, Feb 8 at 2:30pm with a multi-media sound show around the rites and legends of the Chinese lunar year. Over the weekend, the museum is organizing an activity around the theme of “Animals of the Zodiac” as well as guided tours weaving through the permanent Chinese collection. Interestingly, February 11 is considered the birthday of all humans, so eat noodles to promote longevity. The food bloggers, Chopchicks in Paris, who search for the city’s best Asian restaurants each week, loved the options at Happy Nouilles in the 3rd arrondissement. And February 17 is a day to cleanse after the rich food of the holidays. A good day to treat yourself to a healthy meal in celebration of your body this new year!